Anybody up for some old-school, not-quick-and-easy, very detailed, completely captivating holiday appliqué? Then I have just the thing for you! 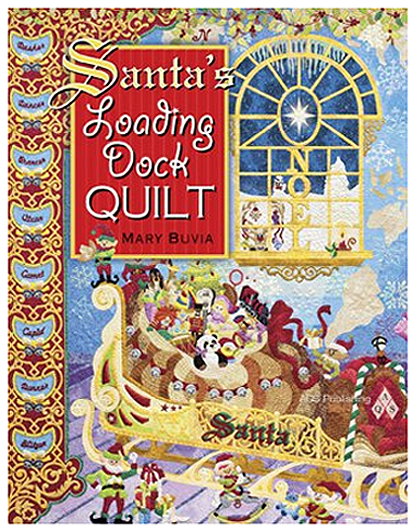 Santa’s Loading Dock Quilt by Mary Buvia is this month’s featured book, courtesy of AQS Publishing. Wow! What a quilt! You can see a closer photo of it on Mary’ website. This is a masterpiece, and accordingly Mary was awarded Master Quilter status by the American Quilters Society. 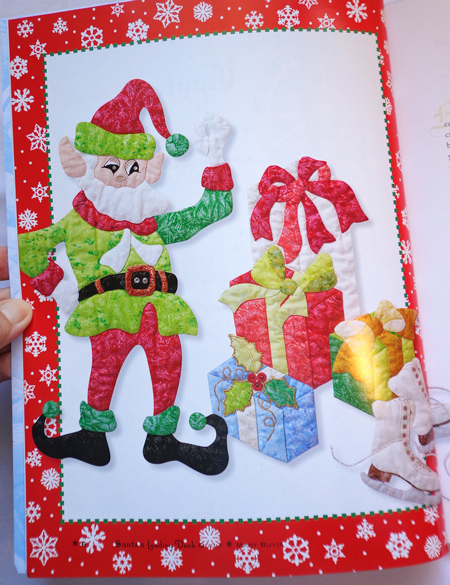 The book gives you all the patterns and information you’d need to recreate the entire jolly scene; however, Mary encourages you to use whatever smaller elements from it that you like to make a smaller quilt or decorate other projects. Mary’s appliqué method involves double freezer-paper templates, starch, and glue to create prepared-edge pieces for hand appliqué. The book also gives information for raw-edge machine appliqué if that’s what you prefer. Many of the templates are given full size; however, some of them you’ll need to enlarge 200%. So, who’s itching for some exceedingly cute holiday stitching? If you’d like to win this book, please leave a comment by 7:00 p.m. on Thursday, November 1. Open to U.S. and Canada mailing addresses only. P.S. I’ll be in Lodi, California, this weekend for the Tokay Stitch ‘n Quilt Guild show. This is a lovely show put on every other year, and the ladies serve a delightful afternoon tea for all! This book looks wonderful Kay. I would love to win it! I was absolutely amazed the first time I saw pictures of this quilt. I would love to own a copy of this book. Thanks for hosting a giveaway and a chance at winning. I’ve seen pictures of this amazing quilt and would love to own the book! What a beautiful quilt! I would love to win a copy of the book and learn Mary’s techniques. Thanks for the chance to win a copy! I saw this quilt in Paducah and it was a “OMG” take your breath away moment. SO gorgeous! I’d love to be able to make one of the smaller portions of the quilt. It is to die for! what detail on that phenomenal quilt. Amazing! I would love a chance to win the book. Wow….what a great quilt! I need to go to her website to see more. I’d also be interested in learning her applique method! I saw the quilt in Columbus, Ohio it was fantastical times 2. I’d love a book about the quilt and her applique method. So when will you be doing a show in Ohio? I can wish can’t I?. My favorite quilts to make are holiday quilts. This quilt is stunning!!! I love to applique and the details are amazing. This quilt would keep me in the holiday spirit all year long. Saw the quilt in person and was in awe. I would love to win this book. This would certainly be an amazing Christmas project. I would love to learn her technique. There’s nothing better than hand stitching! This definately looks like a family heirloom to pass onto future generations. I would love to win this book. Wow Kay – I would love to win this book! I love to hand applique, and it would be awesome to make the entire quilt for me and bits of it for each of my kids! I love that quilt and would love a copy of the book. The quilt in person is amazing! What talent! This would make an incredible quilt. Would love to win this book. I was fortunate enough to see this quilt in Paducah. It is spectacular. Would love to win this book and attempt to make a small portion. Thanks for the opportunity. What an adorable book! Would love to give this one a shot! Thanks for bringing this to our attention. I saw this quilt at AQS in Des Moines. It is the most fabulous quilt I have ever seen. I would really love this book!!!! I’ve seen this quilt in person and it is truly an amazing quilt. It would be so cool to win the instruction book! Thanks for the opportunity. Oh my goodness! Amazing…just amazing! I’m new into applique and what an inspiration this would be. What a wonderful book…to win! I just learned to do needle turn applique. This book is just perfect, i love Christmas it is my favorite time of the year. I would love to win this book. Thank you so much for the chance. Happy quilting to one and all. Those quilts look absolutely gorgeous. I would love to win this book. I use the freezer paper, starch method for applique along with doing some raw edge. I would love to win this book! I love it! Are you kidding me! Oh my I’d LOVE to win this book. I remember seeing a picture of this quilt in a magazine a long while ago. I saw the pictures of this quilt when it was at the quilt show. It is absolutely breath taking. I would love to win the book. A quilt and a work of art. Absolutely gorgeous. I would love a chance to win the book. Thank you! Her quilts are just gorgeous! I am not sure I could make it but I sure would love a chance to try! Thanks! This quilt is so lovely! The DETAIL! I would love to win this book. Thanks for hosting. Wow! The attention to detail in this quilt is amazing! 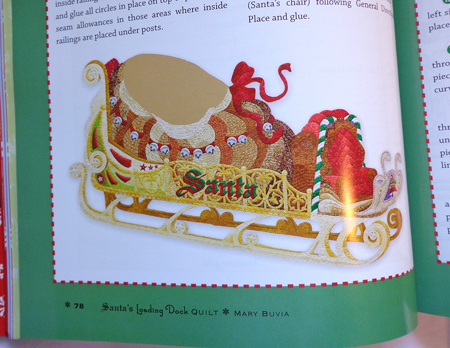 I’d love to win this book, and try my hand at Mary’s double freezer paper technique! Thanks for the chance to win! This book is terrific, I have been wanting to get my own copy for a couple of weeks. I saw the original quilt in Houston last year. I spent about an hour really looking at all the details. Very special and creative addition to quilt history. I would love to win this book. I borrowed a copy from the library: it is beautiful quilt!!! Thanks. WOW. book looks exciting .My grand daughter and I have just started to look for patterns for Xmas gifts, She especially likes applique so this would be great for both of us. I have seen this quilt in person and thought it was absolutely phenomenal! Let’s hear it for the not-quick-and-easy detailed applique! It seems like all the nmagazines and shops are going for the quick and simple stuff these days…it’s great to see a book that isn’t about instant gratification. I hope it is very successful! This is such a beautiful quilt. Would love to win a copy of the book. I saw this book in my local quilt shop and it’s beautiful. I fell in love with this quilt the first time I saw it. I would love having the pattern book. Thanks for the chance to win it. What an amazing quilt! I would like to learn the double freezer paper method. Thanks for a chance to win this book! I would die for this wonderful book. I LOVE doing Christmas quilts as well as any other quilts. Can’t stop thinking about this georgous quilts. The front of this book just draws you in. I can picture my own project. Cross my fingers hope I win. What a wonderful quilt and book. Thanks so much for the chance to win a copy – it looks just delightful! I saw this quilt last year in Houston, and fell in love. Then Mary told her story, and it really touched my heart. Love is so huge, isn’t it? This is SO adorable! I’d love a copy! Thanks so much for the give away! What a great Christmas quilt, I’d love to win the book. Thanks for the giveaway. I’m pretty sure this is the same quilt that Santa was sitting in front of at Quilt Market just past….and it was stunning!! If you’re not giving away the quilt, I’d be happy with the book! oh I hope I didn’t miss the opportunity. This book looks great! Ok myself and a couple other ladies have decided to make ourselves one of these. Upon reading the directions we could not figure out how to do the globe. Does anyone have any suggestions?